What a lovely Sunday, and i thought id finish the evening with a post on my favorite lipstick at the moment for summer 2011!. Only purchased last week and im doing my best not to over-use it! 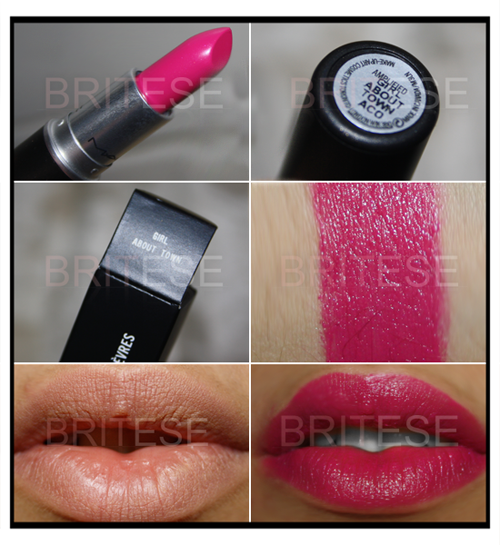 Girl About Town, is an amplified lipstick with amazing pigmentation. Blue toned Pink with the colour you see in the tube is what you get on youre lips. Staying Power - amazed it stayed on all through -out my shift at work which was from 9 till 5 which included me eating and drinking too! It lasts on your lip all day and thats what i call long lasting lipsticks ladies! Packing - MAC has their bullet case lipstick black that looks to be filled with sparkles all over. Opens and closes very well ..
Scent - i get compliments on the vanilla scent MAC's lipstick have, i just love them. Lipstick - I love the moisturizing texture they all have. Staying power and the amazing colour for the summer all together. @Dyna, i'll have a look out for that nyx dupe thanks! @Manda, it does! its amazing how bold colours are so in atm! thanks @Fables in Fashion, Means alot that you enjoy it.